It’s often said that bathrooms and kitchens sell homes. That’s why it’s so important to perform regular bathroom renovations to make it really stand out. Is your bathroom lined with the once-fashionable, now out-dated tile that was used when your home was built? Does the builder-grade cabinetry look all the worse for years of wear and tear? Perhaps only a full-scale gut renovation could bring it up to your standards. There are, however, many situations where a few discreet, modest upgrades can achieve high-impact results. 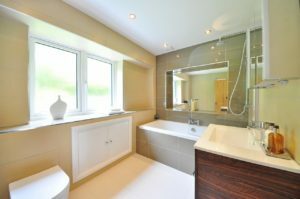 Consider the following bathroom renovation projects to transform this space. 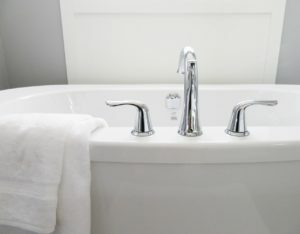 Swapping outdated sink & tub fixtures can go a long way to giving your bathroom an updated look. Go for popular finishes like chrome or brushed nickel that pair well with most tile. Consider installing luxury features such as multi-head shower heads or multifunction shower systems for a spa-like feel. For shared bathrooms, installing an extra sink can be a brilliant move. As a rule, you’ll need a minimum of a 60” vanity to comfortably accommodate two sinks. Under-mount sinks will make the most of limited space. Quartz or granite countertops is a popular choice. Swap out dated light fixtures for something more stylish, current, and functional. For a layered lighting effect, include overhead cans as well as task lighting at the vanity mirror as well as the ceiling over the tub or shower. Standard height for old vanities was 32”. Today’s vanities are 36’H offering more convenience. Choose a new vanity with multiple drawers that provide the convenience for storing cosmetics and toiletries. Removing soffits above the tub, shower, or vanity will drastically increase the visual size of the bathroom. If your bathroom has a tiny, outdated tub, consider having a contractor replace it with a spacious shower. Thoughtful features like built-in shelves, storage niches and benches are upgrades you will greatly appreciate. Whether it’s on the floor, tub surround, or shower, choose your tile wisely — it’s not something that can be easily replaced down the line. Stick with classic designs & light neutral colors you can live with for a long time. Large tiles make a small room appear larger. Replace your old frameless wall mirror with a new stylish framed mirror above each sink. It will add some personality to the room. Acrylic resurfacing (glazing) can instantly transform a dated pink bathroom into a new white bathroom for a small cost. Glazing a tub runs around $350 and a tile surround runs around $750. Resurfacing is the process by which a durable, sprayed-on acrylic coating is applied. The look, quality, and durability of glazing tub & tile gives you the quickest fix and has the biggest bang for the buck. Replace your low round bowl toilet with a “comfort height” taller toilet with an elongated bowl. Replace old lead piping under your sinks and the sewer line with new PVC. Whether you’re putting on makeup or just trying to wake up, natural light in a bathroom is always a win. Replace a small window with a larger one or add a small transom window to help a small bathroom feel airy and bright. Does the power in areas of your home go out when using multiple plugged-in devices? Make sure the bathroom’s electrical has it’s own dedicated outlet in the electrical panel. GFI outlets near the sinks are required to meet safety codes today., Update all electrical in bathrooms for safety & maximum use. Few areas of your home have as much of an impact on potential buyers as your bathroom. After the kitchen, the bathroom is the most visited and scrutinized room in your home. 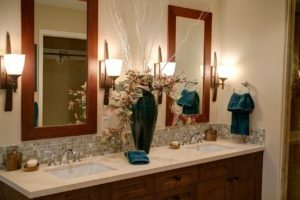 Money spent on a bathroom remodel brings a 97% return on money spent. Smart, inexpensive upgrades can significantly improve the visual appeal of your bathroom. Give yourself a new bathroom for the upcoming holidays. You won’t regret it! You can also learn more about getting your home ready to sell here. Thinking of doing a renovation? Choosing colors and finishes can be overwhelming. Wondering what sells homes? Give me, Sandy Hunter, a call today for a complimentary consultation. I’m always happy to help!